1. That there is no right or wrong. Because Berlin is a fairly cheap city to live in, many people don’t do the ordinary 9-5 jobs. That means that going out on a Monday night dancing or having brunch on a Wednesday morning is totally normal. In other words, you are able to do what you want, when you want it, and to lead a life that is not restricted by norms and the normal/right way to things. 2. The big selection of food from all over the world. Knowing what a food-lover I am, so of course this point had to be on the list. Berlin is a melting pot of people from all over the world, which means that there are restaurants and eateries that serve food from all over the world, and they are located right next to each other. It doesn’t take more than a walk down the block and you are able to choose what you are having for dinner and pick between several different things to eat such as Vietnamese food, Turkish food, Italian food or German food. 3. 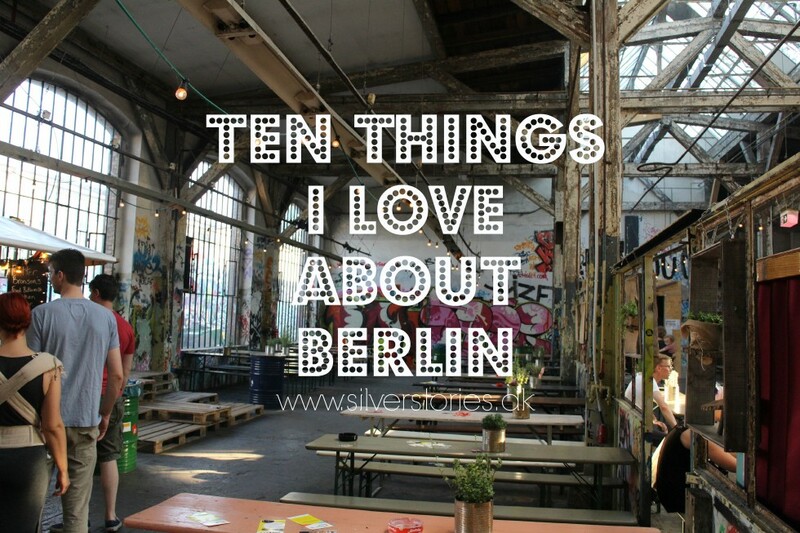 All the cool spots that you will only find in Berlin. A former airport that is now used as a huge park? An urban garden on the 7th floor with a 360 grade view of Berlin on top of a concrete shopping mall? A former landfill that is now turned in to being an urban garden made by volunteer Berliners? Several amazing street food markets? They are all to be found in Berlin, and they are absolutely fantastic. 4. All the cool people you meet. Whether they be German, Australians traveling through Europe or other expats from around the world, they all have a couple of things in common. They are openminded people and they all love Berlin. 5. The evidence of history that can be found everywhere. It is astonishing to think that just 25 years ago there was a big, fat wall that parted Berlin into two and separated families and suppressed millions of people, and just a little more than 20 years before that, most of the city was bombed to the ground. Berlin has survived all of that and managed to overcome a ton of problems and has today come out on the other side being one of the most popular cities in the world. Even though Berlin is passed war, bombings and communism, there are evidence all over the city that proof it was here. 6. The Berlin night life. The night life of Berlin goes as being one of the best in the world with clubs open constantly from Thursday to Monday and soundsystems and DJ’s that will blast your mind. 7. The uncountable cafes. The mixture of good coffee and yummy cake served in a hip decorated room, I just love. Whether you want to catch up with friends, enjoy some alone time or bring your laptop to get some work done, there is a nice cafe for you. 8. The mood of the city. All though Berlin is a big city, in my opinion, it doesn’t have that big city bustle that for example can be found in the streets of Manhattan, New York City. There is no crowd of people that will bump in to you and push you if you stop in the middle of the street, and people don’t run around in suits looking stressed and miserable. The mentality of the people in Berlin seems more free and relaxed. 9. That it is possible to bike in Berlin. Many cities aren’t bike friendly, and while Berlin might not have bike lanes in every street, the city is still bike friendly and it is the absolute best way to get around the city, to experience it and to get to know it better. 10. That Berlin is Berlin. No city is perfect, neither is Berlin, but that fact is kind of the beauty of the city. Berlin wouldn’t be Berlin without the punks camping and begging for money along Warschauerstraße with banners saying “for beer and weed”. Berlin wouldn’t be Berlin without the old, unpolished buildings, the graffiti, all the imperfections.